We all love a good furniture makeover, and these don't disappoint! Get prepared to swoon over these 19 furniture pieces that have been painted in totally unexpected ways. Each piece is inspiring because they're extremely unique. If are you're looking for ways to make over your latest thrifted find, these painted beauties will inspire you! Who doesn't love a colorful pillow? 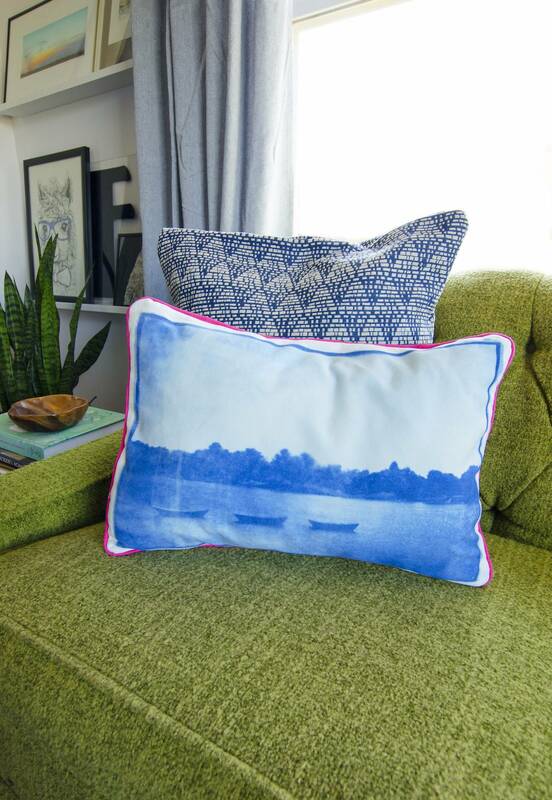 Moreover, who doesn't love a bold, graphic colorful pillow with a personal touch? This simple technique allows you to print any image of your choosing onto fabric, then sew it up for a totally custom look. Right? Right. Let's make one! It's that time of the year. When spring is oh-so-close, but it's still gray and cold outside. Which makes it the perfect time to add some much needed color to your home in anticipation of spring! Here are ten cheery, colorful decorative items that are sure to get you excited for warmer weather. The backyard is a great place to experiment with color - outdoor pillows, tablecloths and chair cushions can all be switched out relatively inexpensively. So go for it... give color a try for your next BBQ or backyard party! Here are ten of our favorite colorful backyards to inspire you. There's something so appealing about a cozy reading nook, isn't there? Whether it's a window seat, a reinvented closet space or just a corner of the room, creating a comfy space specifically for indulging in books and magazines is sure to up your reading time. Here are ten drool-worthy colorful reading nooks that you'll want to recreate in your home. This month, Curbly is excited to team up with designer and TV host David Bromstad, of HGTV's Design Star and The White Room Challenge. David is offering his professional tips about one his biggest passions: using color to transform everyday rooms into something extraordinary. Whenever people ask me where to start with finding the right colors for their home; I always recommend learning the basics. First of all, it is important to think about the psychological effects of the color you are choosing! For instance, blues, greys and greens have a calm soothing effect; they also help you concentrate and keep you focused. I'll admit it: I'm an excitable guy. I get really energized by surrounding myself with inspiring things. And this DIY geometric mobile project combines three of my favorites: the combination of natural wood grain and solid color, kinetic, evolving art, and really inexpensive materials that come together to look like something I'd paid bundles for. Whether used as a learning tool for kids or simply as a decorative coffee table or bookshelf object, these DIY wooden gradient blocks are easy to make -- and gorgeous! Make It: DIY Paint-Dipped Wooden Utensils! The paint-dipping craze isn't going anywhere anytime soon, kids. Which is a-okay in my book (I secretly love it... okay it's not really that big of a secret). If you feel compelled to dip everything within a 5 mile radius in paint as well, you'll love this DIY idea! How To: Dye Your Laptop Using Common Fabric Dyes! This DIY goes out to all the design-minded, technically inclined, color-loving Mac geeks. You are a beautiful and unique snowflake -- and so is your laptop! Move over beige! Today we're welcoming bold, energizing colors with open arms--and giving neutrals the boot. We've rounded up ten hue-happy bedrooms that are sure to inspire the colorholic in all of us! It's that part of year when next year's color trend predictions are coming out, and it's a good time to start thinking about bringing more color into your home. In our case, Alicia usually tries to repaint the living room at least once or twice a year, just for good measure, and to drive me completely crazy. It's easy to get excited about furniture. And it's plenty fun to explore paint colors, wall art options, and accessories. After all, those are what go into a room's design, right? Well, yeah. That's part of it. But don't forget those other two sides of the space - the ceiling, and the floor. Of course, a room defining floor piece can often cost significantly more than that can of paint or awesome framed print. Like, a whole lot more. Unless, of course, you take Holly's advice, and transform the whole space for a cool $50.